The time has finally come. After two exciting rounds in Lonato and Castelletto di Branduzzo, the third and last showdown of the 2018 WSK Final Cup is taking place this weekend on the Adria International Raceway, taken by storm by 230 drivers, some of them eager to conclude their season on the highest note possible. 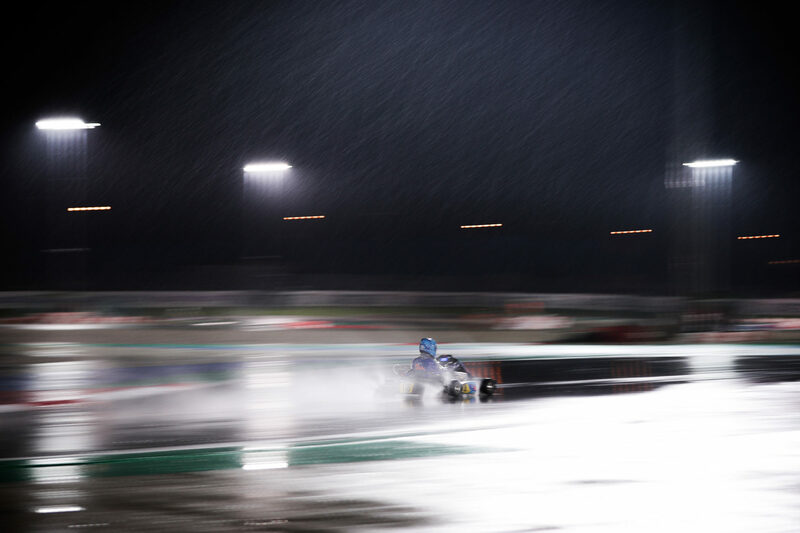 But a good weekend shall require a good start as we take a closer look at Friday’s Qualifying sessions and the first round of Heats, as the four classes involved (OKJ, OK, 60 Mini and KZ2) already had to face tricky weather conditions in Northern Italy. James Wharton (FA Kart-Vortex) topped the first qualifying group of the Junior class (77 drivers) in 55.767 seconds around the 1.3-kilometer Adria circuit. And the Australian could thank the Italian heavens which quickly opened to flood the track for the remaining Groups 2 and 3. In those difficult conditions, Nikita Bedrin (Tony Kart-Vortex) emerged with the second-fastest lap (and pole position in the Group B for the heats) ahead of Hungary’s Levente Reversz (Exprit-Vortex), Maya Weug (Luxor-LKE) and Loris Cabirou (Kosmic-Parilla) due to start at the front of their respective heats in the groups C, D and E. The current category’s leader Taylor Barnard (KR-Parilla) managed to set the 6th-fastest time while other category’s contenders got trapped by the slippery track like Kai Askey (FA Kart-Vortex) in 33th and Kirill Smal (Tony Kart-Vortex) in 39th. The first Qualifying Heat (C-E) of the weekend saw the Swede William Siverholm (Tony Kart-Vortex) gaining nine positions to claim victory in front of Gilles Stadsbader (Exprit-TM) and Maxim Soldatov (Energy Corse-TM). Kai Askey (FA Kart-Vortex) had a good run as well making up eight places to finish 5th, two positions ahead of Gabriele Mini’ (Parolin-TM). The other heat of the day (B-D) smiled upon Nikita Bedrin (Tony Kart-Vortex) who kept his advantage from the pole with Kirill Smal (Tony Kart-Vortex) coming home from 16th on the grid to second! Thomas Ten Brinke (FA Kart-Vortex) completed the top-3 in front of Alex Dunne (Exprit-TM), who overtook 19 drivers (!) on the wet, and Rosberg Racing’s Andrea Kimi Antonelli (KR-Parilla). On a slowly drying track, Andrea Rosso (Parolin-TM) took the overall pole position for his first appearance in the OK class (47 drivers), three-tenths of a second (1:03.744) faster than Nicklas Nielsen (Praga-Parilla), on pole in the Group B, while category’s current leading man Lorenzo Travisanutto (KR-Parilla) put himself in third (pole-sitter in the Group C) ahead of Viktor Gustafsson (Kosmic-Vortex) who’s due to start on the top spot in the Group D. The heat opposing groups A and B enabled Andrea Rosso (Parolin-TM) to grab his first win of the weekend ahead of Nicklas Nielsen (Praga-Parilla) before the KSM Schumacher driver received a three-second penalty for incorrect positioning of his front fairing, promoting Spain’s David Vidales (Tony Kart-Vortex) in second. In the C-D Qualifying Heat, Lorenzo Travisanutto (KR-Parilla) also went from pole to victory while Joseph Turney (Exprit-TM) crossed the line in second but couldn’t do much to threat the leader due to the track conditions. Viktor Gustafsson (Kosmic-Vortex) was third in front of European Junior Champion Paul Aron (FA Kart-Vortex) and Dexter Patterson (KR-Parilla). The rain was still part of the deal when the 85 drivers of the 60 Mini class took to the Adria track. Surprisingly, the Russian Alexandr Tibekin (DR-TM) showed an impressive pace to top the classification in front of Brando Badoer (Parolin-TM) and Maksim Orlov (Parolin-TM). Oscar Pedersen (Luxor-LKE), the American Mateo Rubio Luego (Parolin-TM) and Constantin Krapin (Parolin-TM) were fourth, fifth and sixth-fastest and will get to start on the first spot of their respective heat’s groups (from A to F). The category’s leader Alex Powell (Energy Corse-TM) was 18th at the end of Qualifying. Tibekin went on to win his first heat (A-B) in front of Rafael Modonese (Parolin-TM) and Gleb Protasov (Parolin-TM) while Badoer and Belgium’s Ean Eyckmans (Parolin-TM) both got penalized for incorrect positioning of their front fairing. The C vs. D race was dominated by Orlov from pole to finish, six seconds clear off Pedersen (Luxor-LKE) and Yuanpu Cui (Tony Kart-Vortex) in third. Finally, the opposition between Groupe E and F was won by Rashid Al Dhaheri (Tony Kart-Vortex) who made up four places to have the edge on Jamaïca’s Alex Powell with the pole-sitter Mateo Rubio Luego (Parolin-TM) finishing third. The weather wasn’t ready to give up for the last Qualifying session of the day, this time concerning the 18 drivers of the KZ2 class. Adrien Renaudin (Sodikart-TM) kept his Castelletto’s form going by claiming pole position for almost a second over Dylan Davies (DR-Modena) with Ariel Levi (Sodikart-TM) outdistanced by 1.5 seconds in third. Renaudin’s closest rival for the title, Emilien Denner (Kalikart-TM), conceded him 2.3 seconds with the 6th-fastest lap. A top-3 in Qualifying that would remain similar in the first of the three heats leading to Sunday’s Final as the European champion kept his head down to win in front of Davies and Levi, Denner gaining two positions to finish fourth in front of his fellow countryman Jean Nomblot (Sodikart-TM). The second day of the 2018 WSK Final Cup’s round 3 on the Adria International Raceway will kick off this Saturday at 08:40 am with the first warm-up sessions followed from 10:00 am by the next rounds of Qualifying Heats.